Published in 1958, Good Housekeeping’s Hamburger and Hot Dog Book “novel uses for America's favorite meats”. This copy has some wear on the seam, but the pages are still tight and clean for its age. Like the Culinary Arts Institute, Good Housekeeping published a series of these fun and funky cook-booklets filled with recipes ranging from weird to wonderful. They also document the great food photography and illustration styles of that era… and the fonts… gotta love the fun fonts! Hamburger and Hot Dog Book has 68 pages of recipes and tips, and awesome illustrations. 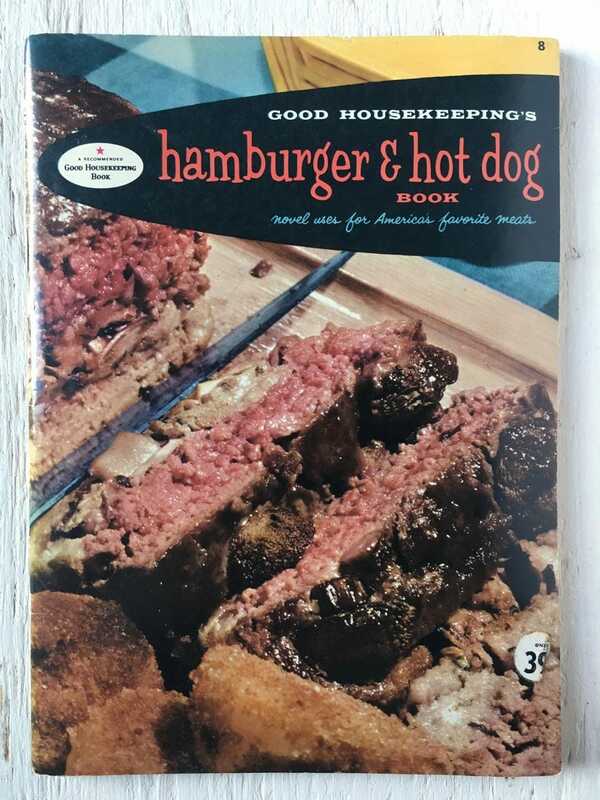 If you are looking for creative recipe ideas for your hamburger or hot dog meals, this is the cool vintage cookbook for you! Check my shop for more from the Good Housekeeping series, the Culinary Arts Institute series, and other individual vintage cookbooks!